The young Scots law student James Boswell (1740-95) first met Johnson in 1763, and the two formed a lasting friendship, much of which Boswell recorded in his extensive journals. Boswell’s Life of Samuel Johnson appeared originally in 1791. But he produced one work this year, fully sufficient to maintain the high reputation which he had acquired. This was “The Life of Richard Savage;” a man, of whom it is difficult to speak impartially, without wondering that he was for some time the intimate companion of Johnson; for his character was marked by profligacy, insolence, and ingratitude: yet, as he undoubtedly had a warm and vigorous, though unregulated mind, had seen life in all its varieties, and been much in the company of the statesmen and wits of his time, he could communicate to Johnson an abundant supply of such materials as his philosophical curiosity most eagerly desired; and as Savage’s misfortunes and misconduct had reduced him to the lowest state of wretchedness as a writer for bread, his visits to St. John’s Gate naturally brought Johnson and him together. 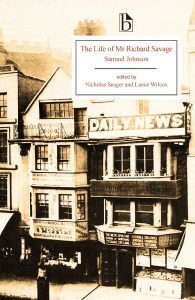 It is melancholy to reflect, that Johnson and Savage were sometimes in such extreme indigence, that they could not pay for a lodging; so that they have wandered together whole nights in the streets. 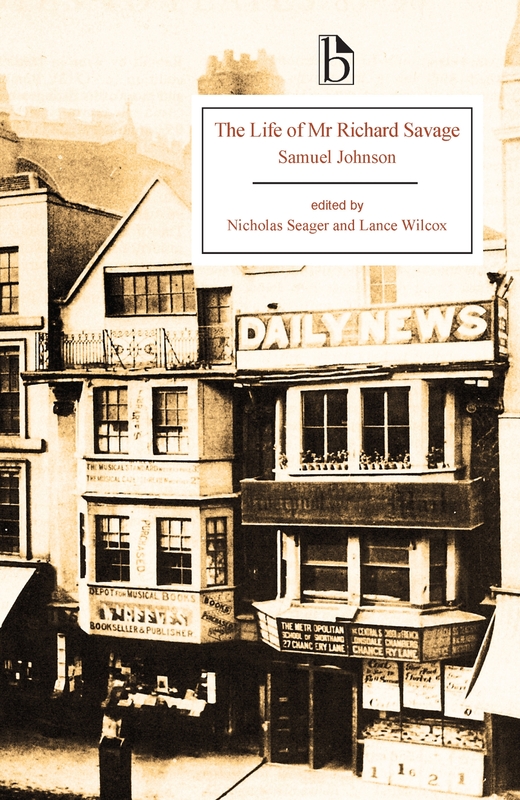 Yet in these almost incredible scenes of distress, we may suppose that Savage mentioned many of the anecdotes with which Johnson afterwards enriched the life of his unhappy companion, and those of other Poets. I am afraid, however, that by associating with Savage, who was habituated to the dissipation and licentiousness of the town, Johnson, though his good principles remained steady, did not entirely preserve that conduct, for which, in days of greater simplicity, he was remarked by his friend Mr. Hector; but was imperceptibly led into some indulgencies which occasioned much distress to his virtuous mind. That Johnson was anxious that an authentick and favourable account of his extraordinary friend should first get possession of the publick attention, is evident from a letter which he wrote in the Gentleman’s Magazine for August of the year preceding its publication. Horace (65-8 BCE), Ars Poetica (10-8 BCE), l. 317: “Look to life and manners for a model” (Satires, Epistles, and Ars Poetica, 476-77).